This is how I make ribbons in PSP. * Greg's Factory Filters (free) from HERE (scroll down). 1. Open a new canvas 1000 x 500 pixels with a white background. Add a new raster layer. 2. 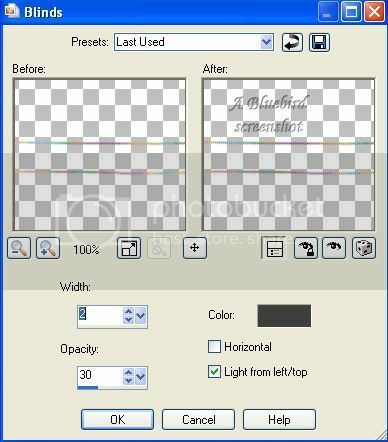 With your selection tool set on rectangle and feather on 0, draw out a rectangle the size you want your ribbon to be. 3. Floodfill on new raster layer with the colour or pattern of choice. DO NOT deselect. 4. Apply Pool Shadow at the settings given below. You can adjust the intensity and lightness for stronger or weaker effect. 6. Selections - Modify - Contract by 2 or 3 (depending on size of your ribbon) - Invert. 7. 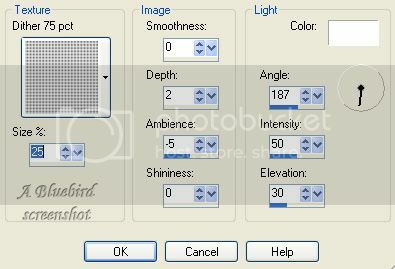 Effects Menu - Texture Effects - Blinds - use settings below. You can change the colour according to the colour of your ribbon and whether you want a darker or lighter effect. 8. Select none. Trim the edges of the ribbon (use your selection tool on rectangle to select then press delete) to remove the blinds effect from the ends. 9. To give your ribbon a less straight look, run your Warp Brush gently along the edges using the settings below. Click on the green apply tick when you are finished warping. Your ribbon is finished. I hope you enjoyed this tutorial. I loved it. I played around with it in PSP 9 and X2. Had to go get .dll files and jump through hoops and thought I was spinning wheels. Had to tweak both programs, 9 didn't perform as well as X2, but after a number of tries, I was like OMG, that looks like grosgrain ribbon. Fantastic. Thank you so much. Hmm, now if I can just figure out to put a spiffy edge on it.